Many countries have experimented with different electoral rules in order either to increase involvement in the political system or make it easier to form stable governments. Barry Ames explores this important topic in one of the world's most populous and important democracies, Brazil. This book locates one of the sources of Brazil's "crisis of governance" in the nation's unique electoral system, a system that produces a multiplicity of weak parties and individualistic, pork-oriented politicians with little accountability to citizens. It explains the government's difficulties in adopting innovative policies by examining electoral rules, cabinet formation, executive-legislative conflict, party discipline and legislative negotiation.The book combines extensive use of new sources of data, ranging from historical and demographic analysis in focused comparisons of individual states to unique sources of data for the exploration of legislative politics. The discussion of party discipline in the Chamber of Deputies is the first multivariate model of party cooperation or defection in Latin America that includes measures of such important phenomena as constituency effects, pork-barrel receipts, ideology, electoral insecurity, and intention to seek reelection. 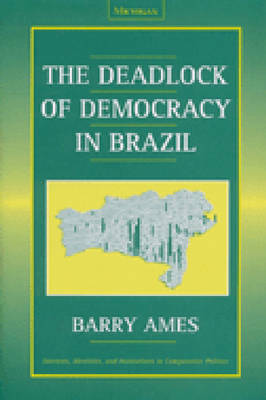 With a unique data set and a sophisticated application of rational choice theory, Barry Ames demonstrates the effect of different electoral rules for election to Brazil's legislature.The readership of this book includes anyone wanting to understand the crisis of democratic politics in Brazil. The book will be especially useful to scholars and students in the areas of comparative politics, Latin American politics, electoral analysis, and legislative studies.Barry Ames is the Andrew Mellon Professor of Comparative Politics and Chair, Department of Political Science, University of Pittsburgh.